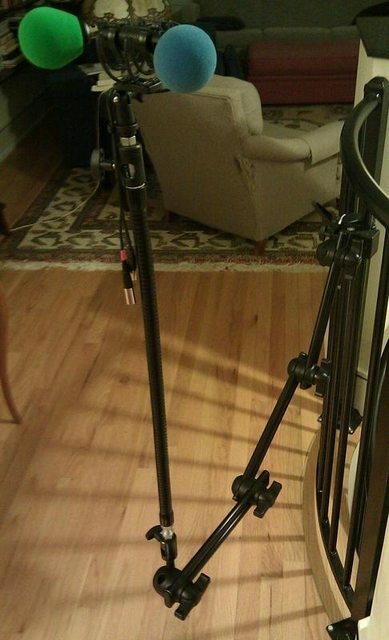 Here is what I hope is a helpful pic of running 4 mics on the Manfrotto Double Articlated arm. To get the two pairs on the end, I just used two Manfrotto rapid adapters, with one pointing up, and one pointing down. Please post pics when you get this straightened out. superclamp > 396-ab > rapid adaptor > 237HD > rapid adaptor > rycote shockmount. 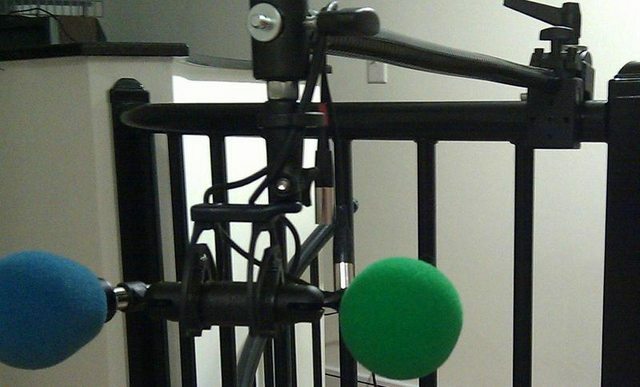 Closeup of the bendy arm with the shockmount and mic caps. Felt much better about the upright version, so I think it's truly a load issue. I debated trying to go 237 > 396 but I had other stuff to do and walked away at that point. I may have to do some more research on >6' extensions and see what I can pull off. 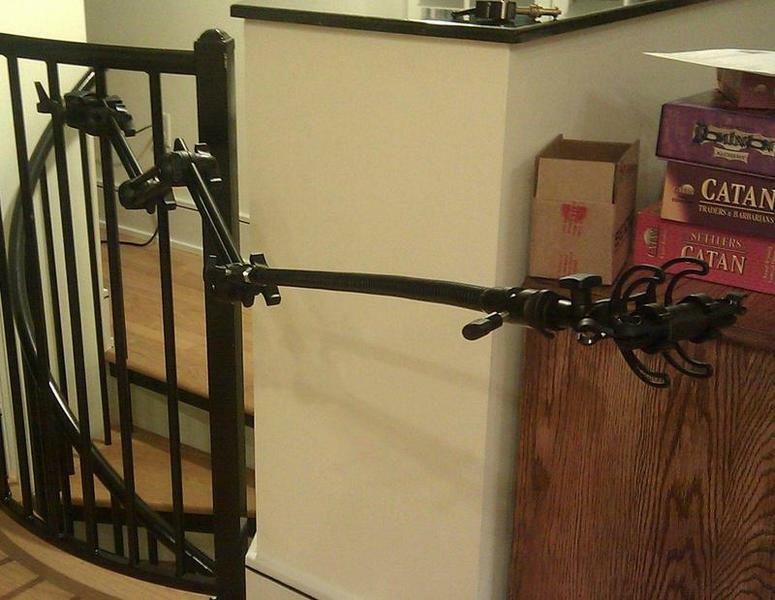 That Manfrotto Double Articulated arm is a pretty sweet piece of hardware. First time I came across one was at B&H's brick and mortar store and I must've played with that thing for a good 15 minutes, lol. it wicked is! That and my nano > reversable stud > rapid adaptor combo get the most use of any accessory I have, sometimes I even use them together if i'm really trying to get distance. Only beef is I wish it had standard screw fixtures instead of that quicklock mechanism. but yeah, they are nice. Thanks for the pics, Page. I'm gonna have to pick up one of those articulated arms now, methinks. Yeah me too! What was the damage on that one, Page? Forgive me, but the narcissistic in me is beginning to believe this thread might be an all-time ts.com classic. Keep up the good work, gents. I am learning so much... Keep them posts and photos coming! The 396-AB3 is what I have in the pictures, it can contain the most weight of all of them. They say they can support 11lbs load, but I wouldn't try it, or if I did, I'd figure out the whole force/load calc to ensure I had some extra leeway before I left home. I've put an LSD2-clone on it before a couple of times with success, but having the 237HD worried me the most cause of how it was outstretched with weight. The articulated arm can definitely take a heavy load - and you pay for it. Run outward as in my photo above, though, bring on the LDs! Running laterally, I'd probably be more concerned about the stress on the articulated arm's stud rather than the super clamp and the arm itself; the brunt of all that weight is focused on the one bit of metal. Rigging it up with a few safety cables is always good for some extra insurance. and since it's so long, I end up using 2 cables. I worry most about the joints than the stud connection. The superclamp holds something like 25lbs of load, so I wire it up with a cable but I dont worry about it very much.